It seems like I am spending a lot of time up in the air. 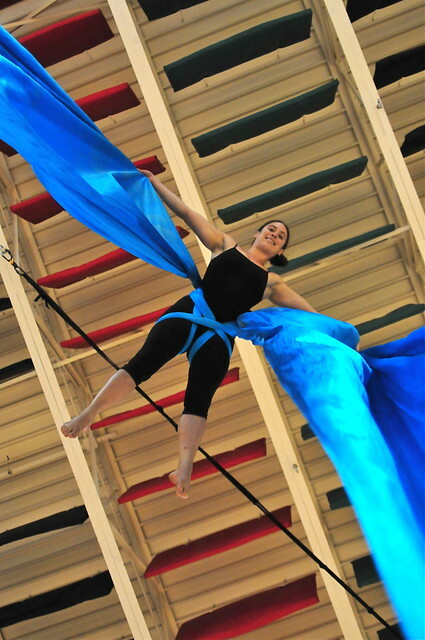 Rehearsals for the upcoming Cycropia Aerial Dance performance - August 26-27 at the Orton Park Festival - are ramping up. Extra rehearsals are being considered and scheduled. Muscles barely have time to recover before the next one. Small aches become familiar friends. It is worth it though. In no other way is my life so interesting and fun. My body is challenged in ways that are difficult or impossible to replicate in a gym. My brain is forced to come to terms with different (perceived) risk and perform well in unusual positions and situations. Somehow I think that is good for my brain. In this photo, Luv is near the ceiling in her silk prepared for a dramatic drop. Catch the show and you will see it unfold.